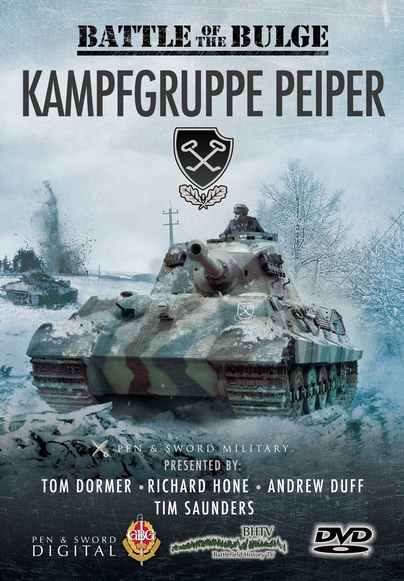 You'll be £16.99 closer to your next £10.00 credit when you purchase Battle of the Bulge: Kampfgruppe Peiper. What's this? Sepp Dietrich's Sixth SS Panzer Armee was allocated the main effort in Hitler's last throw of the dice in the West. Under cover of poor winter weather that would ground the Allied air forces they were to punch through weak American positions in the Ardennes to the River Meuse and on to Antwerp cutting off and destroying the northern Allied Armies. The German generals protested that it was too ambitious but Hitler insisted, hoping that his elite SS troops in the Leibstandarte Panzer Division would deliver a war changing victory. From the outset the King Tigers of December 1944, in poor winter weather, could not cut through the forest roads as the smaller Panzers had done in 1940 but were slowed down by determined resistance by small groups of American GIs, Obersturmbannfuhrer Jochan Peiper, commander of the elite spearhead, the Leibstandarte's 1st Panzer Regiment advancing west on one of the Division's three rolbhans became increasingly frustrated by enemy resistance and poor roads. Eventually anger boiled over into atrocity and the murder of US soldiers at Malmendy and elsewhere along the route. Experienced soldiers, historians and film makers analyse events on the very ground where they happened, stripping away legend and obfuscation of all kinds to present the facts for the viewer to make their own decision on.